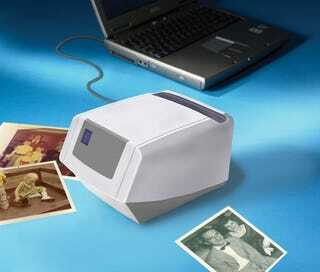 Photograph-to-Digital-Picture Converter Sounds A Lot Like "Scanner"
Goofy gadget masters Hammacher Schlemmer are back at it again with a Photograph-to-Digital-Picture Converter that takes your old paper snapshots, and well, digitizes them. Now we know what you're thinking—isn't this just a scanner with a more complicated name?—and at first, I was inclined to agree. But digging deeper I found that this may not be a bad specialty box for $150.